I have a simple question about strings in Java. The following segment of simple code just concatenates two strings and then compares them with ==. The comparison expression concat=="string" returns false as obvious (I understand the difference between equals() and ==). The comparison expression concat=="string", in this case returns true. Why does final make a difference? Does it have to do something with the intern pool or I'm just being misled? which when compared to "string" will give you true, because string literals are interned. Compile-time constant expressions of type String are always "interned" so as to share unique instances, using the method String#intern(). This is not the case in your first code example, where the String variables are not final. So, they are not a compile-time constant expressions. The concatenation operation there will be delayed till runtime, thus leading to the creation of a new String object. You can verify this by comparing byte code of both the codes. Clearly it is storing str and ing in two separate variables, and using StringBuilder to perform the concatenation operation. So it directly inlines the final variable to create String string at compile time, which is loaded by ldc operation in step 0. Then the second string literal is loaded by ldc operation in step 7. It doesn't involve creation of any new String object at runtime. The String is already known at compile time, and they are interned. So, if you really need to compare two String using == or != make sure you call String.intern() method before making comparison. Otherwise, always prefer String.equals(String) for String comparison. So it means if you call String.intern() you can compare two strings using == operator. 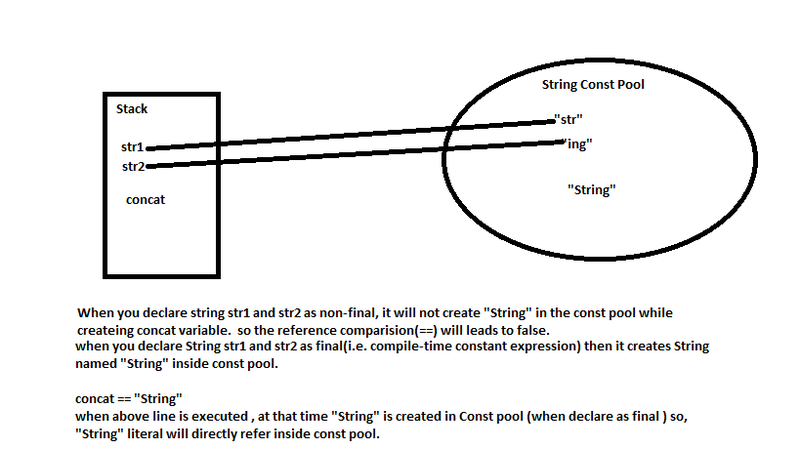 But here String.intern() is not necessary because in Java final String are internally interned. You can find more information String comparision using == operator and Javadoc for String.intern() method. Also refer this Stackoverflow post for more information. which means that concat will be created at runtime so will not come from String pool. which means that concate will become sting literal which will be interned in string pool and then compared with same string literal from that pool in if statement. At 0: and 2:, the String "string" is pushed onto the stack (from the constant pool) and stored into the local variable concat directly. You can deduce that the compiler is creating (concatenating) the String "string" itself at compilation time. Here you have two String constants, "str" and "ing" which need to be concatenated at runtime with a StringBuilder. Though, when you create using String literal notation of Java, it automatically call intern() method to put that object into String pool, provided it was not present in the pool already. Why does final make a difference? Compiler knows the final variable never gonna change, when we add these final variables the output goes to String Pool because of str1 + str2 expression output also never gonna change, So finally compiler calls inter method after output of the above two final variables. In case of non-final variable compiler do not call intern method. Can somebody explain why this is prints false? How is this thing works internally?